Summary: Ideal for those buying their first rowing machine or those wanting an intermediate workout, this good value equipment will certainly see you feeling fitter and looking more toned. This rowing machine has a solid discount at the time of writing (from an already low base). Check out the customer feedback + latest discount on the amazon.co.uk product page now. Rowing machines offer one of the best all body workouts, training every large muscle group in the body. This V-fit rowing machine is in the low cost bracket and will certainly work those key areas such as the chest, the back, the arms, the abdominals and the shoulders. 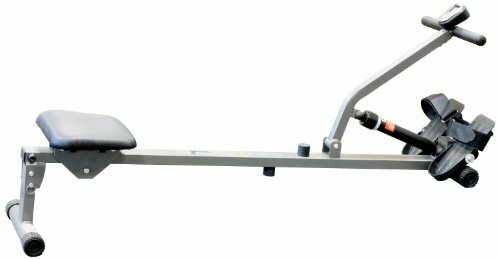 The rower has eight levels of hydraulic resistance, making the equipment ideal for both beginners and the more experienced fitness enthusiast. You’ll find an LCD exercise monitor which will display the stroke count, the strokes per minute, time, scan and the theoretical calorie count, ensuring you can keep a good track of your exercise. The machine has pivoting foot plates to ensure a natural rowing action and adjustable foot straps which will keep your feet secure. For added comfort, the rower has a smooth action mounted padded seat and high density handlebar grips. With a total weight of just 10.5kg, this machine is easily transportable, making it ideal for use around the home or garage, while suitable for all users up to 100kg (222 lbs). This is certainly reasonable in price in comparison to other similar pieces of equipment, this due to the large discount offered by amazon. Reviews of the rowing machine are mostly very positive. Assembling the equipment is said to be particularly easy, taking just 15 minutes. Statements such as ‘Value for money’ and ‘excellent piece of kit for the money’ appear regularly, while it is also said to be sturdy too. Some suggested that it might not be suited to the more serious rower, perhaps being a little lightweight, but is certainly ideal for the beginner. For a good value rowing machine, the V-fit Fit-Start Single Hydraulic Rowing Machine makes for an ideal purchase. Great for use in the home, the multiple resistance settings will ensure that your workouts continue to push you further and see you toned.